Kensington Pavilion office space is situated on the high street in the sought after area in West London above the renowned Ivy restaurant. The interior is modern throughout and has been refurbished to a high standard with stylish furniture and bespoke artwork. With standard offices and penthouse office suites to rent at the Business Centre, there are also luxury features available including room service, telephone answering and secretarial support. 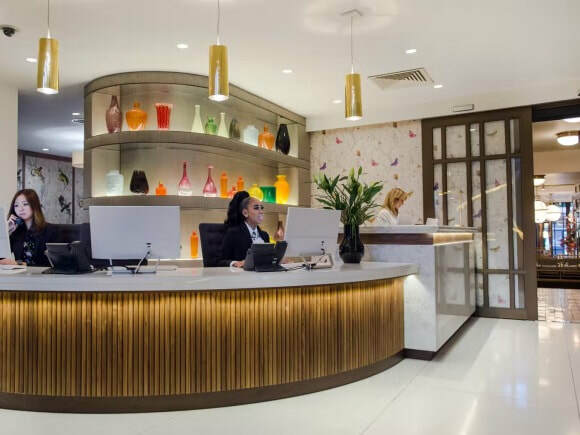 The reception area is manned at all times with professional staff and is ideal for welcoming visitors or guests to the property. Benefitting from a range of meeting rooms at the site, this serviced office also has comfortable lounge areas which create a more relaxed feel to the working environment. The office rentals in Kensington Pavilion are also accessible 24 hours a day.